No question about this contender for Game of the Week. Anyone who has read yesterday’s report from the Bridge match will have noticed that not only was there just one Broadstairs winner on the night but it was a giant-killing of Goliath proportions. Poor Mr Wisman will not thank me for featuring him on the receiving end of a second Game of the Week this season but then he does have the consolation of being a member of a Millar Cup-winning team. In the final position resignation may seem premature but time trouble was a factor. For Bob Cronin it was a triumph that he won’t forget for a long time. This week’s game features a typical swashbuckling performance from Paul Carfrae, a win that set the Broadstairs team on the way to a crucial victory in the Hargreaves Shield against a Woodnesborough side that had won all its previous matches. Hold on to your seats! This week’s game is a fine win by Reg from our recent match with Herne Bay. Losing the exchange early on, he fought back to win a pawn and then turned the tables with a neat finish. As the Tata Steel Masters Tournament enters the final straight, it has been an eventful few days for Wei Yi. After eight successive draws, he must have read our last post because, as predicted on this very site, he came out with all guns blazing in round nine to defeat David Navara – the pair are pictured right – in a cracking game. 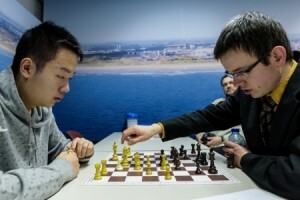 Navara, thereby, features for the third time, suggesting after his loss to Hou Yifan – sadly, defeat to Magnus Carlsen today was her fourth in a row – and victory over Fabiano Caruana that it has been a real rollercoaster week for him. In an interview after his win, Wei Yi admitted that judgement should wait until he had played Caruana the next day. Unfortunately, the world number five was a step too far for the 16 year old Wei who crashed to his first defeat in the tournament. His time will come, however. In the meantime, enjoy the following game which only confirms what we already knew, that he is a very exciting prospect. The first Game of the Week for the New Year features one of my better efforts. Unfortunately, it was not enough for us to beat a typically strong Bridge A side but there was no disgrace in our defeat. The game looks like a brief encounter but it took over three hours owing to the considerable thought given by my opponent throughout which may well have led to his losing on time anyway. After applying pressure, I was pleased that I finally managed to find a way through only for James Essinger to point out afterwards that I missed a mate in two a move earlier (29. Qxg8+)!